Shark Heroes III: Madison Stewart - We Love Sharks! Shark Heroes III: Madison Stewart - We Love Sharks! Madison Stewart is the “Shark Girl” fighting to save the Ocean’s top predators. Madison Stewart, also commonly known as the “Shark Girl,” is a dive master and an underwater filmmaker. She strongly advocates for the protection and conservation of sharks. Over the years, her film and videos have been featured on different media and social platforms. For her, nothing feels better than being in shark-infested waters. Her love for the widely feared predators has seen her sacrifice friends, family and school. All this because Madison believes these creatures are wrongly persecuted. She was born in Australia and grew up spending much of her time on the oceans. Having lived in a yacht since she was two years, Madison always treated sharks as family. The 24 year old began scuba diving at the age of twelve. Following an interview with a local television, she says that her father introduced her to the oceans through books and documentaries. By the age of 14, she started filming under water. As a result, her many ocean encounters over the years intensified her passion for sharks. When she discovered that these ocean creatures were disappearing at an alarming rate, she decided to raise awareness. So far, she has proven that these animals are not the killing machines as portrayed in movies. At the age of 14, Madison returned to the Great Barrier Reef expecting see lots of sharks and the same old reef. She was in for a shock: she saw just one shark in the water, hiding timidly, and too afraid to come close to her. With the consent of her dad, Madison opted for homeschooling in her teens. The aim was to allow her afford an underwater video system. Even so, she says it was the best decision she ever made. She believes the time she has spent in the midst of sharks give her a better understanding of how they relate with their environment. Although she would like to go back to school someday to further her education, she would not like to spend too much time pursuing university education. At the age of 19, Madison Stewart produced a film “Shark Girl” on the Smithsonian Channel. This film shed light on the shark meat trade in Australia. She also featured in a 2016 underwater documentary, Sea of Life by Julia Barnes. Sea of Life also featured the late Rob Stewart. 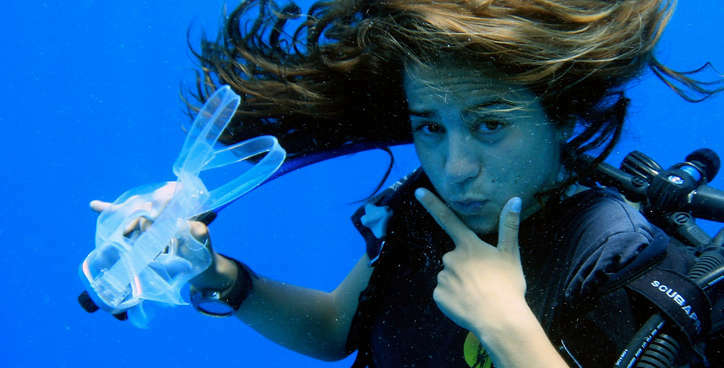 She has become popular all over the world for her underwater photography. Her videos are also available on her YouTube channel. However, she always emphasizes that she is not an activist. The Shark Girl further states that the underlying problems of shark-human issues need to be addressed by the Australian government. Following an interview with one of the local newspapers, she said she was on mission to end illegal shark fisheries inside the Great Barrier Reef. Madison Stewart believes that more than 90 percent of the shark population has vanished due to unregulated fishing practices. In addition to that, most people care less about these important species. She has continued to educate people that they should look at sharks as the king of the ocean. Because, when you kill the king, you kill the kingdom. Recently, she was filmed touching the skin of the Great White Shark. The video went viral which made her even more popular. She has vowed to dedicate her life to this cause and most importantly, she travels all over the world to change the way people see these creatures. Below is a trailer from Shark Girl. Madison Stewart is happy at the opportunity to pursue her dreams, and she now dives without the protection of a cage and comes face to face with different species of sharks.